From Vulcan to vultures, today’s element brings stories of unintended consequences. 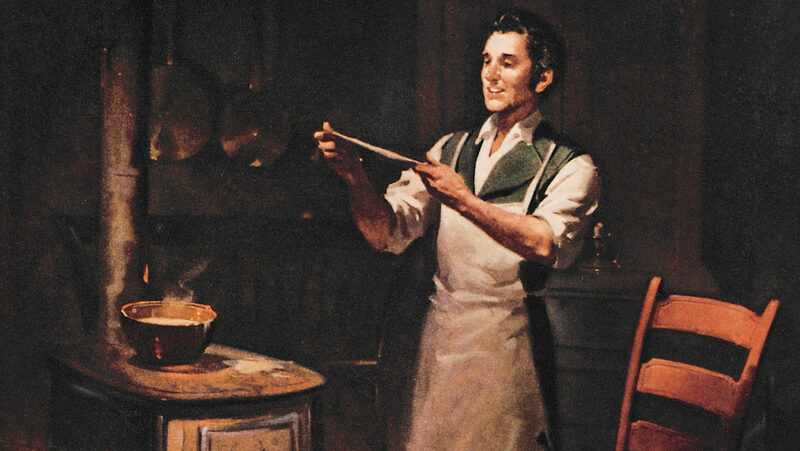 Featured above: A painting of Charles Goodyear discovering the vulcanization process. Bacterial Birth Control: So why is prontosil so effective in humans (and mice) if it did absolutely nothing in the petri dish? There are two main reasons: It needs to be biologically processed into something else, and it doesn’t actually kill bacteria. Prontosil is actually a precursor to the drug that works its magic, sulfonamide. Mammalian cells crack prontosil in half to produce sulfonamide, so it wasn’t actually present in the petri dish. As far as its mechanism of action, sulfonamide merely inhibits bacterial growth — but this is enough. Slowing down or stopping bacterial reproduction means the immune system can attack the bacteria naturally without becoming overwhelmed. Some doctors are looking toward this class of drugs again as traditional antibiotic resistance becomes more of a problem. Fun with Fricatives: You may be more familiar seeing element 16 spelled with a ph, as in “sulphur.” That’s just as correct as “sulfur!” The same situation is going on here as happened with aluminium: The IUPAC recommends a particular spelling, in this case the one with the F, but — even though “sulphur” is the common spelling in the UK — does not see that as an acceptable variant. Bookended by last episode’s luciferous reactions and the cleansing fire of chlorine we’ll discuss next episode, today we remain trapped on all sides by a hellish inferno. Not many chemical elements get called out by name in the Bible, but sulfur gets no fewer than 15, usually in a punitive context, as in the preceding quote from Psalm 11, verse 16. In some translations it’s called “brimstone,” but make no mistake: element 16 is the projectile in question. This is due to its propensity to burn, known since ancient times, often with a distinct smell that’s quite appropriate to accompany a serving of supernatural ire. Sulfur compounds are infamously pungent. The scents of rotten eggs, a skunk’s spray, and halitosis are all thanks to the presence of today’s element. Today, we’re holding our noses as we investigate sulfur. Surprisingly, pure sulfur has no odor. But if even trace impurities are present, sulfur’s smell can repel like nothing else. So perhaps it’s not so surprising that some of the most important chemical discoveries involving sulfur have come about entirely by accident. Many, many of science’s most important and famous discoveries happened serendipitously, but on the short list of contenders is Charles Goodyear’s discovery of vulcanization. Goodyear was an inventor, chemist, and entrepreneur born in New Haven, Connecticut on December 29, 1800. This made him just the right age to be young and hungry when all of America got caught up in a bit of a craze over rubber. Pretty much every rubber manufacturer went out of business within five years due to the material’s instability, but Goodyear thought he was the man who could make a fortune by manufacturing rubber that didn’t liquefy in the heat, nor turn brittle and crack in winter’s cold. Coincidentally, around that time his prior business failures landed him in debtor’s prison, but he didn’t let this deter his curious mind. While jailed, his wife brought samples of rubber to Goodyear, where he began his experiments to synthesize a more viable material. After his release from prison, he continued his experiments for many years, treating natural latex rubber with magnesia, and quicklime, and nitric acid. Goodyear’s refined mixtures improved over time, but each one suffered some kind of fatal flaw that made it impossible to sell. Pretty much everyone told him to give it a rest, including his brother-in-law, who didn’t believe it was possible to make a useful substance out of rubber. Working with hazardous chemicals was taking a toll on his health, as well. He was working closely with lead, he almost suffocated on one occasion, and he nearly died of a fever brought on by harsh chemical vapors. Inspired by Vulcan, the Roman god of fire, Goodyear patented the process under the name “vulcanization.” This was the breakthrough that eventually led to rubber raincoats, tires, and even a certain famous blimp bearing his own name, although that only happened long after he died. We do love our dirigibles here on the Episodic Table of Elements. But whatever you think of Goodyear as a scientist, there’s no doubt he was a terrible businessman. Under his patent, the license was so cheap that he couldn’t really make any money off of it. Worse yet, other swindlers infringed on his patent, and soon Goodyear was drowning in lawyer’s fees. Goodyear’s interest in vulcanization was purely academic. Or perhaps more accurately, economic. But the point is, he could afford to take his time with his inventions. Our next scientist found himself dealing with a problem far more personal in nature, and racing against a much faster clock. Gerhard Domagk was a German pathologist who, in the 1930s, was trying to cure infectious diseases with industrial dyes. One of the theories floating around at the time was that bacteria could be killed by turning their internal organs the wrong color, so he was testing a sulfur-based red dye called prontosil. In one trial, he infects two groups of lab mice with ten times the lethal dose of streptococcal bacteria. He treated the first group with prontosil, and left the second alone as a control group. A few days later, all the mice treated with prontosil were alive, and all the rest were dead. This was the experiment that would be stuck in his head a few years later, in 1935, when Domagk’s six-year-old daughter, Hildegard, tripped and broke off a sewing needle in her hand. A doctor cleaned the wound as best he could, but in the ’30s, that didn’t mean very much. Even small cuts and scrapes like this were prone to infection that was often lethal. In 1924, President Calvin Coolidge’s son got a blister on his foot from playing tennis, and within a week, was dead from bacterial infection.6 Sure enough, Hildegard became bedridden with a high fever. Soon, the doctor warned, she would require an amputation to prevent the infection’s spread from her arm to the rest of her body. Domagk could only think of the mice who had been able to fight off an infection just like this with prontosil. But mice are not humans, and other trials provided Domagk with a heaping portion of doubt. When doused with prontosil in a petri dish, streptococci fared just fine. They didn’t die off, or appear to suffer any ill effects whatsoever. What few human trials had occurred didn’t conclude anything definitively, except that prontosil reliably caused people’s skin to turn a bright red color. This was a harrowing dilemma for Domagk. He knew that amputation was a last-ditch effort that was likely to merely delay the inevitable, but he was also aware that by administering experimental drugs, he could very well make himself liable for the death of his own daughter. Whatever his thought process, he came down on the side of action. He quietly purloined samples of the red dye from his lab, took them home, and injected them his daughter’s veins. One can only imagine what he must have thought when Hildegard quickly took a turn for the worse. Her fever spiked, then fell, then spiked again, over the course of weeks. Finally, on Christmas Eve, 1935, she stabilized and made a full recovery — and was able to keep both her arms. For his discovery, Domagk was awarded the 1939 Nobel Prize in Medicine. In previous episodes, we’ve seen how this can sometimes be a mixed blessing, and so it was for today’s hero. See, earlier in the ’30s, the committee had awarded the Nobel Peace Prize to Carl von Ossietzky, a German journalist, pacifist, and socialist who was outspoken against the Nazi regime. Not every accidental finding is so beneficial. Sometimes, a discovery is simply disgusting. An embarrassing ordeal, no doubt, but at least this time, no one wound up in prison. But searching beneath a group of ominously circling vultures is likely to lead to disappointment for the element collector as well. Even assuming that the scavengers have located a natural gas leak and not some freshly prepared roadkill, mercaptan is a light, colorless gas that disperses easily. Fortunately, solid sulfur is easy to get a hold of. It’s an integral part of Epsom salt and alum, which you might have picked up after the episodes on magnesium and aluminum, respectively. It’s also in some other common minerals, like pyrite and gypsum, which is frequently sold as chalk. Thanks for listening to The Episodic Table of Elements. Music is by Kai Engel. To learn why prontosil did nothing to the bacteria in the petri dish, and why it works on humans, visit episodic table dot com slash s.
Next time, we’ll take a dip with chlorine. This is T. R. Appleton, reminding you that it’s a real bad idea to look back at that city the Lord is obliterating with fire and brimstone. Salon, Eating Satan’s Footprints. Susan McCarthy, October 29, 1999. Interesting Engineering, Charles Goodyear: The Father Of Vulcanization. Christopher McFadden, December 17, 2017. Connecticut History, Charles Goodyear And The Vulcanization Of Rubber. Ann Marie Somma. Make, Charles Goodyear And The Vulcanization Of Rubber. William Gurstelle. They Laughed At Galileo: How The Great Inventors Proved Their Critics Wrong. Albert Jack, 2015. BC Medical Journal, Never Say Dye. J. C. A. Morrant, March 2012. Chemistry Chronicles, Miracle Medicines. David M. Kiefer, 2001. Time, The Tragic Nobel Peace Price Story You’ve Probably Never Heard. Noah Rayman, October 10, 2014. Gerhard Domagk: The First Man To Triumph Over Infectious Diseases, p. 85. Ekkehard Grundemann, 2006. NPR, The Saga Of A Sulfa Drug Pioneer. Scott Simon, December 23, 2006. Science History Institute, Gerhard Domagk. December 4, 2017. Sulfanilamide (And Its Relatives), Simon Cotton, Uppingham School, Rutland, UK. Real Clear Science, The Dangerous Stink Of The World’s Smelliest Chemical. Ross Pomeroy, July 31, 2017. In The Pipeline, Things I Won’t Work With: Thioacetone. Derek Lowe, June 11, 2009. ThoughtCo., 10 Molecules You Don’t Want To Mess With. Anne Marie Helmenstine, June 4, 2017.
io9, This Is The World’s Smelliest Chemical. Esther Ingliss-Arkell, May 19, 2015. Popular Science, Gas Leaks Are Designed To Attract Turkey Vultures. Kelsey D. Atherton, January 25, 2016.